What is Fancy Feast Classic Cat Food? 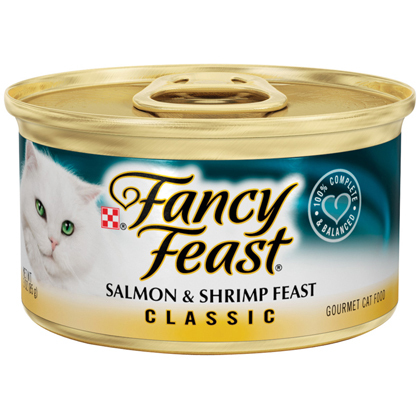 Fancy Feast Classic Cat Food is a traditional pate containing broth and meat (seafood, poultry, or beef). Buy Fancy Feast Classic Cat Food with confidence with our 100% satisfaction guarantee. Daily ration for an average adult cat is 1 can per 3-1/2 pounds of body weight. Feed up to twice this amount to kittens. Pregnant or nursing cats may require two to four times their normal feeding. For a special treat made with real meat and no by-products or fillers, consider giving your cat Fancy Feast Appetizers. Ingredients: Cod, liver, meat by-products, fish, fish broth, sole, shrimp, artificial and natural flavors, guar gum, added color (Red 3 and other color), calcium phosphate, potassium chloride, salt, zinc sulfate, thiamine mononitrate, Vitamin E supplement, ferrous sulfate, niacin, manganese sulfate, calcium pantothenate, Vitamin A supplement, copper sulfate, menadione sodium bisulfite complex (source of Vitamin K activity), pyridoxine hydrochloride, riboflavin supplement, Vitamin B-12 supplement, biotin, folic acid, Vitamin D-3 supplement, potassium iodide. Ingredients: Liver, meat broth, meat by-products, chicken, poultry by-products, artificial and natural flavors, calcium phosphate, guar gum, potassium chloride, taurine, salt, magnesium sulfate, zinc sulfate, thiamine mononitrate, Vitamin E supplement, ferrous sulfate, niacin, manganese sulfate, calcium pantothenate, Vitamin A supplement, copper sulfate, menadione sodium bisulfite complex (source of Vitamin K activity), pyridoxine hydrochloride, riboflavin supplement, Vitamin B-12 supplement, biotin, folic acid, Vitamin D-3 supplement, potassium iodide. Ingredients: Beef broth, meat by-products, beef, liver, chicken, artificial and natural flavors, calcium phosphate, guar gum, potassium chloride, salt, taurine, magnesium sulfate, added color, zinc sulfate, thiamine mononitrate, Vitamin E supplement, ferrous sulfate, niacin, manganese sulfate, calcium pantothenate, Vitamin A supplement, copper sulfate, menadione sodium bisulfite complex (source of Vitamin K activity), pyridoxine hydrochloride, riboflavin supplement, Vitamin B-12 supplement, biotin, folic acid, Vitamin D-3 supplement, potassium iodide. Ingredients: Meat by-products, meat broth, poultry, poultry by-products, artificial and natural flavors, calcium phosphate, guar gum, potassium chloride, salt, magnesium sulfate, taurine, added color, zinc sulfate, thiamine mononitrate, Vitamin E supplement, ferrous sulfate, niacin, sodium nitrite (to promote color retention), manganese sulfate, calcium pantothenate, Vitamin A supplement, copper sulfate, menadione sodium bisulfite complex (source of Vitamin K activity), pyridoxine hydrochloride, riboflavin supplement, Vitamin B-12 supplement, biotin, folic acid, Vitamin D-3 supplement, potassium iodide. Ingredients: Ocean fish, liver, meat by-products, fish broth, artificial and natural flavors, calcium phosphate, shrimp, guar gum, potassium chloride, added color, salt, zinc sulfate, thiamine mononitrate, Vitamin E supplement, ferrous sulfate, niacin, manganese sulfate, calcium pantothenate, Vitamin A supplement, copper sulfate, menadione sodium bisulfite complex (source of Vitamin K activity), pyridoxine hydrochloride, riboflavin supplement, Vitamin B-12 supplement, biotin, folic acid, Vitamin D-3 supplement, potassium iodide. Ingredients: Salmon, liver, meat by-products, fish broth, fish, turkey, artificial and natural flavors, calcium phosphate, guar gum, added color (Red 3 and other color), potassium chloride, salt, magnesium sulfate, taurine, zinc sulfate, thiamine mononitrate, Vitamin E supplement, ferrous sulfate, niacin, sodium nitrite (to promote color retention), manganese sulfate, calcium pantothenate, Vitamin A supplement, copper sulfate, menadione sodium bisulfite complex (source of Vitamin K activity), pyridoxine hydrochloride, riboflavin supplement, Vitamin B-12 supplement, biotin, folic acid, Vitamin D-3 supplement, potassium iodide. Ingredients: Beef, meat broth, liver, fish, meat by-products, artificial and natural flavors, guar gum, potassium chloride, calcium phosphate, salt, magnesium sulfate, taurine, zinc sulfate, thiamine mononitrate, Vitamin E supplement, ferrous sulfate, niacin, sodium nitrite (to promote color retention), manganese sulfate, calcium pantothenate, Vitamin A supplement, copper sulfate, menadione sodium bisulfite complex (source of Vitamin K activity), pyridoxine hydrochloride, riboflavin supplement, Vitamin B-12 supplement, biotin, folic acid, Vitamin D-3 supplement, potassium iodide. Ingredients: Ocean whitefish, liver, fish, meat by-products, fish broth, tuna, artificial and natural flavors, guar gum, calcium phosphate, added color, potassium chloride, salt, zinc sulfate, thiamine mononitrate, Vitamin E supplement, ferrous sulfate, niacin, manganese sulfate, calcium pantothenate, Vitamin A supplement, copper sulfate, menadione sodium bisulfite complex (source of Vitamin K activity), pyridoxine hydrochloride, riboflavin supplement, Vitamin B-12 supplement, biotin, folic acid, Vitamin D-3 supplement, potassium iodide. Ingredients: Meat by-products, beef broth, beef, chicken, poultry by-products, artificial and natural flavors, calcium phosphate, guar gum, added color, potassium chloride, salt, magnesium sulfate, taurine, zinc sulfate, thiamine mononitrate, Vitamin E supplement, ferrous sulfate, niacin, sodium nitrite (to promote color retention), manganese sulfate, calcium pantothenate, Vitamin A supplement, copper sulfate, menadione sodium bisulfite complex (source of Vitamin K activity), pyridoxine hydrochloride, riboflavin supplement, Vitamin B-12 supplement, biotin, folic acid, Vitamin D-3 supplement, potassium iodide. Ingredients: Turkey, liver, meat by-products, turkey broth, poultry giblets, artificial and natural flavors, guar gum, calcium phosphate, potassium chloride, salt, magnesium sulfate, taurine, zinc sulfate, thiamine mononitrate, Vitamin E supplement, ferrous sulfate, niacin, manganese sulfate, calcium pantothenate, Vitamin A supplement, copper sulfate, menadione sodium bisulfite complex (source of Vitamin K activity), pyridoxine hydrochloride, riboflavin supplement, Vitamin B-12 supplement, biotin, folic acid, Vitamin D-3 supplement, potassium iodide. Ingredients: Chicken, chicken broth, liver, meat by-products, fish, poultry by-products, artificial and natural flavors, calcium phosphate, guar gum, potassium chloride, added color, salt, magnesium sulfate, taurine, zinc sulfate, thiamine mononitrate, Vitamin E supplement, ferrous sulfate, niacin, sodium nitrite (to promote color retention), manganese sulfate, calcium pantothenate, Vitamin A supplement, copper sulfate, menadione sodium bisulfite complex (source of Vitamin K activity), pyridoxine hydrochloride, riboflavin supplement, Vitamin B-12 supplement, biotin, folic acid, Vitamin D-3 supplement, potassium iodide. Ingredients: Fish broth, salmon, liver, meat by-products, fish, turkey, shrimp, artificial and natural flavors, added color (Red 3 and other color), guar gum, calcium phosphate, potassium chloride, salt, magnesium sulfate, taurine, thiamine mononitrate, Vitamin E supplement, zinc sulfate, ferrous sulfate, niacin, calcium pantothenate, Vitamin A supplement, copper sulfate, manganese sulfate, menadione sodium bisulfite complex (source of Vitamin K activity), pyridoxine hydrochloride, riboflavin supplement, Vitamin B-12 supplement, biotin, folic acid, Vitamin D-3 supplement, potassium iodide.